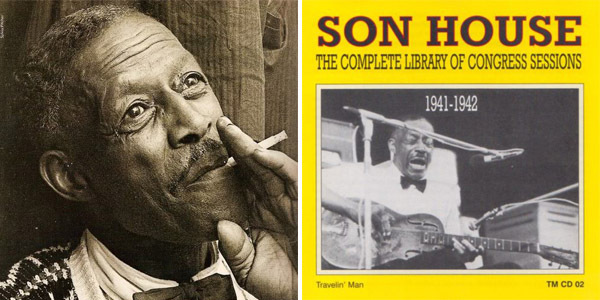 Son House was one of the most deeply affecting blues performers of all time. He had done some preaching in Mississippi, and was apparently quite good at it, though in his own life, the booze and the women kept him from leading the life a preacher was supposed to lead. He did time in Mississippi’s infamous Parchman Farm prison after killing someone (in self defense he said), and left Mississippi after World War II to live in Rochester, NY, where he was rediscovered. House enjoyed some success on the folk revival scene in the 1960s, but was largely unable to perform after 1974 though he lived until 1988. Daniel Beaumont’s “Preachin’ the Blues: The Life and Times of Son House” is an excellent resource on him, and it includes information about another killing House was involved in (this one was apparently judged to be self-defense right at the time). Son House was a major influence to Robert Johnson and also Muddy Waters. Muddy named him as his mentor in an interview with Alan Lomax. His “Death Letter Blues” is surely one of the greatest blues performances ever.